Our study provides insights into the factors governing the spatio-temporal variability of coccolithophores in the equatorial North Atlantic and illustrates how this supposedly oligotrophic and stable open-ocean region actually reveals significant ecological variability. We provide evidence for Saharan dust and the Amazon River acting as fertilizers for phytoplankton and highlight the the importance of the thermocline depth for coccolithophore productivity in the lower photic zone. The Peruvian coastal upwelling ecosystem is a natural laboratory to study climatic variability and climate change. We examined the variability in the OMZ in the last decades in connection with the equatorial Pacific strong 1997–1998 El Niño event and the influence of central Pacific El Niño events and enhanced equatorial Kelvin wave activity since 2000. The data reveal two contrasting regimes and a long-term trend corresponding to a deepening of the oxygen-deficient waters and warming. From the analysis of MODIS and Landsat satellite data of the Jambi province in Indonesia, this first study on the effects of oil palm expansion on the surface temperature in Indonesia shows shows a local and regional warming effect caused by the expansion of oil palm plantations and other cash or tree crops between 2000 and 2015. The observed warming effects may affect ecosystem services, reduce water availabilty in the dry period and increase the vulnerability to fires in the province. Cobalt has the smallest oceanic inventory of all known inorganic micronutrients, and hence is particularly vulnerable to influence by internal oceanic processes. The stoichiometry of cobalt was studied in the North Atlantic, and interpreted with regard to the context of Redfield theory with a focus on biological uptake, scavenging, and the coupling between dissolved and particulate phases. The stoichiometry of cobalt accelerated towards the surface due to increased biological activity and use. Improved modeling of tropical-forest carbon cycling is urgently needed to project future climate and to guide global policy for greenhouse gases. Tropical forests store and process immense amounts of carbon, and their carbon cycling may be responding to climate change. Our goal with this paper, a multidisciplinary collaboration between modelers and field ecologists, is to identify reference-level field data from tropical forests that can be used to guide the models for these key ecosystems. A laboratory incubation was carried out at different soil moisture levels to measure emissions of nitrogen gases and the isotopomers (position of 15N) of nitrous oxide. Flux variability was larger in drier conditions, probably due to nutrient distribution heterogeneity created from soil cracks and consequently nutrient hot spots. Denitrification was the main source of fluxes at higher moisture, but nitrification could have occurred under drier conditions (although moisture was still high). This paper attempts to review some of the current challenges faced by the modelling community in simulating the behaviour of savanna ecosystems. We provide a particular focus on three dynamic processes (phenology, root-water access, and fire) that are characteristic of savannas, which we believe are not adequately represented in current-generation terrestrial biosphere models. We highlight reasons for these misrepresentations, possible solutions and a future direction for research in this area. Computer models of vegetation provide a tool to assess how future changes in climate may the affect geographical distribution of vegetation. However, such models must first be assessed for their ability to reproduce the present-day geographical distribution of vegetation. Here, we assess the ability of one such dynamic vegetation model. We find that while the model is broadly successful in reproducing the geographical distribution of trees and grasses in North America some limitations remain. Observations can reduce uncertainties in past, current, and predicted natural and anthropogenic CO2 fluxes. They provide independent information for verification of actions as requested by the Paris Agreement. Quantitative network design (QND) is an objective approach to optimise in situ networks and space missions to achieve an optimal use of the observational capabilities. We describe recent progress and advocate an integrated QND system that simultaneously evaluates multiple data streams. Climate models containing ocean biogeochemistry contain a lot of poorly constrained parameters, which makes model tuning difficult. For more than 20 years modellers have generally assumed phytoplankton light attenuation parameter value choice has an insignificant affect on model ocean primary production; thus, it is often overlooked for tuning. We show that an empirical range of light attenuation parameter values can affect primary production, with increasing sensitivity under climate change. We studied CO2 emissions from soils that are seasonally water-epellent, and the wetting and water movement is restricted. When CO2 emissions are low soil is consistently water-repellent after a long dry spells, but when water repellency and thus soil moisture are patchy CO2 emission rates are high. The presence of water repellency may therefore increase rather than reduce soil CO2 emissions, which may result in higher soil carbon losses than it was previously anticipated. 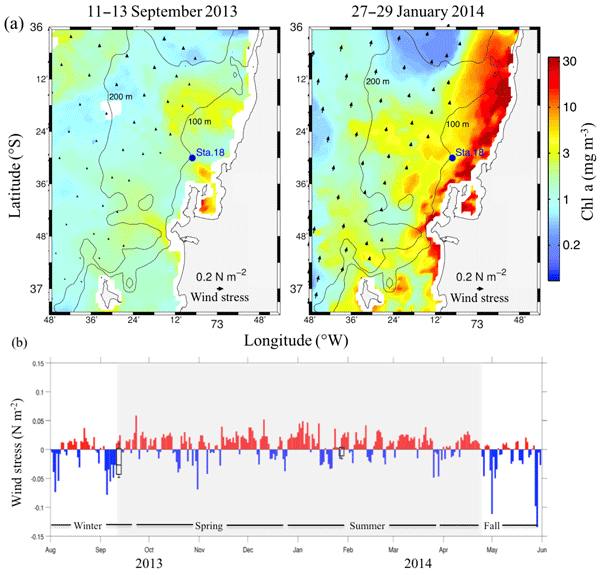 This investigation characterizes the variability of pathways involved in N loss in the water column over the continental shelf off central Chile during the development of the upwelling season. Our results highlight the links between several pathways involved in N removal, and considering the extreme variation in oxygen observed could help to understand the ecological and biogeochemical implications due to global warming when intensification and/or expansion of the oceanic OMZs are projected. Ammonium additions had stronger inhibition effects on soil microbial biomass of different communities than nitrate addition. However, inhibition effects of nitrate additions on P hydrolase were stronger than ammonium additions, but not on C- and N-hydrolase and oxidase. Ammonium additions decreased N-acquisition specific enzyme activities normalized by total microbial biomass, but increased P-acquisition specific enzyme activities. Different effects on soil pH may explain the different effects.